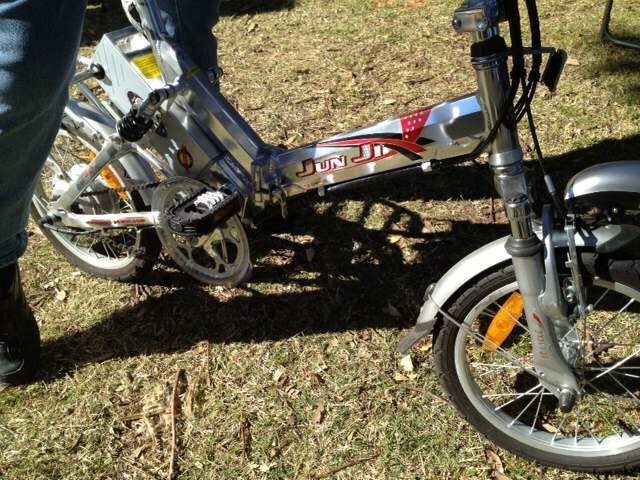 One of my work colleagues saw this electric folding bike in the inner-west in Sydney recently. I’ve never seen anything like this before so I looked it up on the net. It’s called the Jun Ji electric folding bike and is made by an electronics manufacturing company called Zhanhui in Guangzhou, China. There are lots of different styles of the bikes. I think they’re a winner and could take off in a city like Sydney that is (slowly and painfully) embracing a cycling culture. If you’ve got a distance to cover and want to avoid the delays of buses and trains in the city, this could be the answer. This enterprising guy had imported two bikes, one for himself and the other for his wife, directly and said he got it in the country for $A500, which is pretty good. I think it’s a winner. I found some information about the Jun Ji on the San Francisco Citizen blog. It says it might be a little hard to order just one, but why not buy 78, enough to fill up an entire shipping container, from the Jun Ji Power at maybe $250 per and then sell 77 to your friends at a hefty markup.